OneOme's revolutionary test is now available in Europe as well, at our hospital. Why did St. Catherine Specialty Hospital decide to implement pharmacogenetic testing? St. Catherine Hospital is pioneering the implementation of the personalized medicine concept in clinical practice. Our Center for Individualized and Preventative Medicine is designed to bring the latest and greatest innovations in translational medicine to our patients, from glycomics to pharmacogenomics and beyond. Pharmacogenetic (PGx) testing is a critical addition to our personalized medicine program because we know that we can optimize patient health outcomes by using PGx test results to help tailor medications to the unique genetic makeup of each patient. How is St. Catherine helping its healthcare providers adopt pharmacogenetic testing into their practice? Education is a critical part of making our PGx program successful at St. Catherine. The physicians at St. Catherine have worked with the clinical team at OneOme to identify some of the most common and some of the most potentially severe drug-gene interactions, based on medications frequently prescribed within the St. Catherine patient population. St. Catherine’s clinical teams, whether in orthopedics, neurology, gastroenterology, physical medicine and rehabilitation, gynecology, cardiology, or pain management, are knowledgeable about which medications have PGx information on the drug label and where PGx testing is recommended. With continued support from OneOme’s clinical team, we are well positioned to implement pharmacogenetic testing successfully and provide patient care using the most current pharmacogenetic guidance available. How did St. Catherine decide on the OneOme® RightMed test? 1. Scientific rigor. We chose to work with OneOme because of the scientific rigor applied to the development of the RightMed test and supporting tools. OneOme’s PGx interpretation is supported by the highest level of clinical evidence, making it, in my eyes, the most clinically actionable test available. We also like that when OneOme’s clinical development team applies new clinical guidelines or evidence to the RightMed test, patient reports are automatically updated with this new information. 2. Affiliation with Mayo Clinic. We also knew the test was co-developed with Mayo Clinic, which besides it being one of the most well-respected health institutions in the world, is also an organization with which I have a long-standing relationship. In fact, Mayo Clinic, International Society for Applied Biological Sciences (ISABS), and St. Catherine are co-organizers of the “11th ISABS Conference on Forensic and Anthropologic Genetics and Mayo Clinic Lectures in Individualized Medicine,” being held June 17-22, 2019 in Split, Croatia. I serve as the Conference President. 3. Breadth of coverage. St. Catherine sees more than 35,000 patients per year, so we wanted to implement a test that could be applied to a number of specialty areas, including pain, cardiology, neurology, anesthesiology, psychiatry, and cancer. 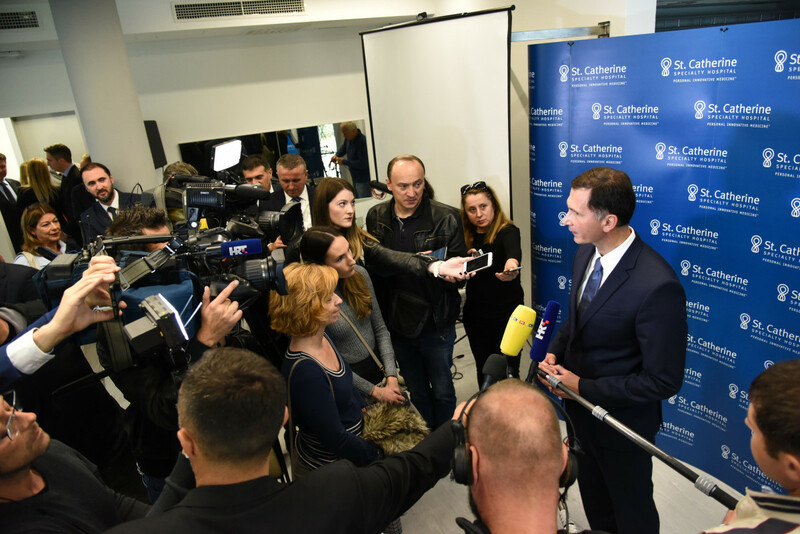 The comprehensive nature of the RightMed test was a critical factor in our decision. Which patients do you think will benefit most from the RightMed test? Everyone can benefit from the RightMed test, as it provides lifelong information about how an individual metabolizes hundreds of medications. That being said, the RightMed test will be highly recommended for polypharmacy patients (those on more than five medications) as well as those taking medications for pain management. Do you plan to share any of the results from your PGx testing initiatives? OneOme and St. Catherine will present the results of our collaboration during the 11th ISABS Conference being held June 17-22, 2019 in Split, Croatia. The conference brings together more than 650 participants from 50 countries, including four Nobel prize laureates. We look forward to sharing details of our collaboration, including our unique approach to implementing pharmacogenetic testing in clinical practice. What would you say to other health system leaders considering pharmacogenomic testing at their institution? It’s only a matter of time before pharmacogenetic testing becomes standard of care, so now is the time to consider how you will implement it: from educating your clinical teams to integrating PGx information into electronic health records. There is mounting clinical evidence supporting the clinical utility of pharmacogenetic testing across multiple indications, so I recommend you choose a platform that will provide clinical benefit to as many patients as possible. Most importantly, choose a PGx testing provider who has a credible clinical development team and a product that is rooted in sound clinical evidence. In an effort to help health system leaders understand the benefits of pharmacogenetic testing, I edited a book with Professor Wolfgang Hoppner, titled Pharmacogenetics in Clinical Practice. In this book, we outline how pharmacogenetics is a critical component of personalized medicine. Original interview is available on OneOme blog.